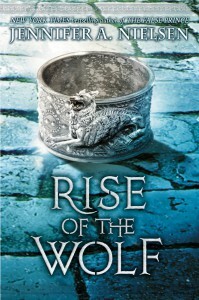 Book Two in the Mark of the Thief series by Jennifer A. Nielsen, Rise of the Wolf carries forward the story of Nicolas Calva who continues to feel like a pawn. In this sequel, Nic continues to crave freedom, but he finds adversaries at every turn. His grandfather General Radulf wants the gods to bow to him, even if that means he has to neutralize his grandson. Atroxia, a vestalis who contin ues in her allegiance to the goddess Diana, will torture him unless he relinquishes the Malice of Mars and creates a Jupiter Stone. Decimas Brutus will go to any length to rob Nic of his power, his loved ones, and his life unless Nic gives him the key he seeks, a key which Nic insists he does not possess. To satisfy these adversaries, Nicolas Calva must race in the Ludi Romani to beat the Praetors—corrupt government operatives. With the fate of the Roman Empire and the lives of everyone he loves hanging in the balance, can Nic, in four days, learn to race a chariot against an opponent driven by greed and one who has sent a thousand other charioteers to their deaths? Exhibiting strength, courage, and nobility while riding for his life and for the future of Rome, Nic quickly realizes that duty and honor are also chains. He further recognizes that love is stronger than magic, that it carries the price of caring for another person, and that victory comes in protecting those he loves, not destroying those he hates. Love is a powerful motivating force. Those who desire praise too much become slaves to that desire. Readers of Rick Riordan’s Percy Jackson Olympian series will likely grow into readers of this young adult series, eager to follow the action and adventures of Nic, Aurelia, and Crispus. Tagged Greek mythology. Bookmark the permalink.